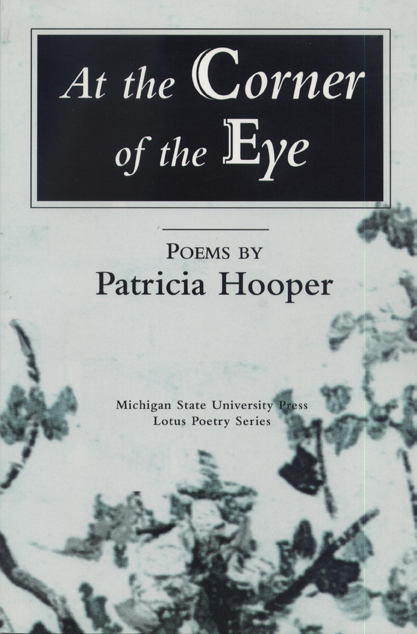 The poems by Patricia Hooper in At the Corner of the Eye are, for the most part, quiet and meditative, weaving into the landscape of southeastern Michigan observations and concerns that are personal and universal. The most ordinary experiences of day-to-day suburban existence are here imbued with significance that only the introspective eye of a poet can detect and reveal Nature and its seasons provide the poet with her most striking metaphors. Patricia Hooper has published three books of poetry and four children's books. She won the 2003 Bluestem Prize for poetry for Aristotle's Garden, published by Emporia State University's Bluestem Press. Another of Patricia's collections of poetry, Other Lives, was awarded the Norma Farber First Book Award of the Poetry Society of America. Her poems have appeared in many magazines including The Atlantic Monthly, Poetry, The American Scholar, Ploughshares, The New Criterion, and The Hudson Review. A graduate of the University of Michigan, where she earned B.A. and M.A. degrees, she has been the recipient of many awards including: a 2003 Bluestem Prize for poetry, Bluestem Press is a imprint of Emporia State University Press; five Hopwood Awards; the Poetry Society of America's Bernice W. Ames Award; and a Writer's Community Residency Award from the National Writer's Voice. She lives in southeastern Michigan.